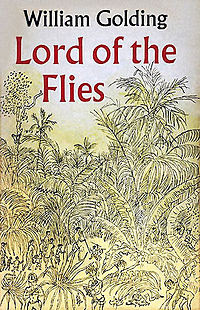 My teaser this week is from Lord of the Flies by William Golding. A group of little boys are stranded on an island. At first, they seem excited about living on their own and being rescued. Soon as they lose touch with the real world, they lose hope, begin to show their weaknesses and descend into a pre-civilized behaviour, the kind that turns them from little innocent children into savage adults. Ahh I remember this very well from the book... great teaser selection. Great book. I'm currently teaching it to my students. They seem to be enjoying it. This is a book I thought I would like but was disappointed in it. It was just so depressing. Amazing teaser, I hope yoy enjoy the rest of the book! Can't say I have read this. It's one of those books that I feel like I already know the story so I don't need to read the book. My teaser this week comes from one of my favourite authors! I have actually never read this book. I know it's a classic, but everyone always says how grim it is. Probably worth it, though. Thanks for the teaser. If you get a chance, mine is here. I've seen bits of the movie. Sounds like an interesting read. Loved this book in High School. Thanks for reminding me why! Definitely a new follower! Here's my teaser: http://aturnofpage.blogspot.com/2011/05/teaser-tuesday-no-3.html. @Karen And Gerard - It's the other way round for me. I thought I wouldn't like it. It is a bit depressing, but I did like it! @Marg - Yea, the story is sort of predictable, but it is nicely written! @Diannehartsock - I am going to have to see the movie, now that I have read it! @Kristyn - Thanks, and thanks for stopping by! Thanks for the reminder - this is a GREAT book I haven't read in such a long time. oh man, i remember this book...and the movie, i bawled. Good teaser! I remember this book from school...this killed me. Totally. A great teaser! I read this book a very long time ago.